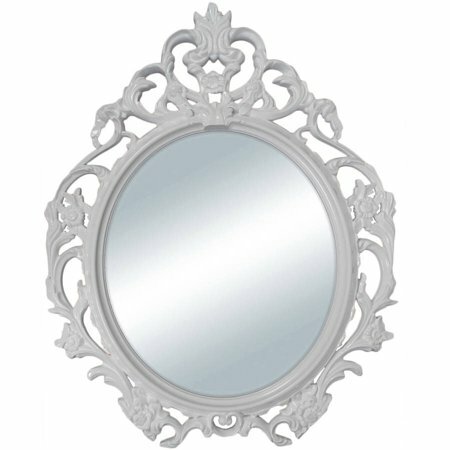 Mainstays White Baroque Oval Wall Mirror 24"x19"
You want to update your living room or entryway, but you're not quite sure what kind of change you want (or need) to make — rest assured, this is a common feeling, no matter which room of the house you're thinking about. Adding a mirror to any room can make that room feel larger or deeper; it will draw in light and make the room feel brighter and airier; it can serve as a new focal point, offering a different perspective and help you experience a familiar room in a new way. This elegant, ready-to-hang oval baroque-style wall mirror by Mainstays will add a new vibe to any room in need of a shakeup or style update. The classic baroque style is surprisingly versatile — try it out in almost any style room, from country French to sleekly modern. I bought this for my daughters nursery. Great quality product for the price. 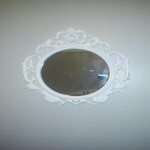 This mirror is beautiful, the color is exactly like in the picture,it is not wood but is perfect for girls princess theme room.. 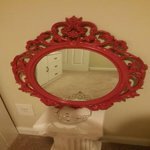 I was very skeptical with several reviews speaking bad of these mirrors. But I'm so glad I bought them. They are good size, and solid. I bought 3 to complete my vanity. Beautiful products!!! I was pleasantly surprised at how nice this mirror was when it arrived. It's much heavier than I thought it would be so it's not flimsy at all. It looks great in my shabby chic room! I completely love this mirror. It fits my french thing. Great value for the price. However, I wish there was a hook so i can hang it on the wall. It was bigger then I thought it would be which I was very happy about.. It looks great. LOVE IT!!!!! I ordered 2 of these mirrors they were exactly what I expected. Nice looking mirror, you would never know it's plastic. Great price, free and fast shipping to store.